Looky, looky, the Seawhawks and the Broncos made it to the Super Bowl this year to each have a go at being the greatest team in the world (this year). It’s a pretty exciting Super Bowl—more exciting than we’ve seen in the past few years—and I think no matter how the game turns out, it’ll be a fun one to watch. That being said, it would be most fun if the Seahawks won because it feels right for a team with lime green in their uniform to win a championship. I also like the narrative of Peyton Manning having an insane season—maybe the best by any quarterback ever—failing to get to the ultimate prize. It’s what made the Giants beating the perfect Patriots in ’07 far more interesting than a potential perfect season. I liked the idea of representing each team with the things that made them up and letting the overlap of the sections be the things that brings them together, the game itself. Design bomb, it’s also in the shape of a football. Do you see that Roger Goodell? I care about the details. 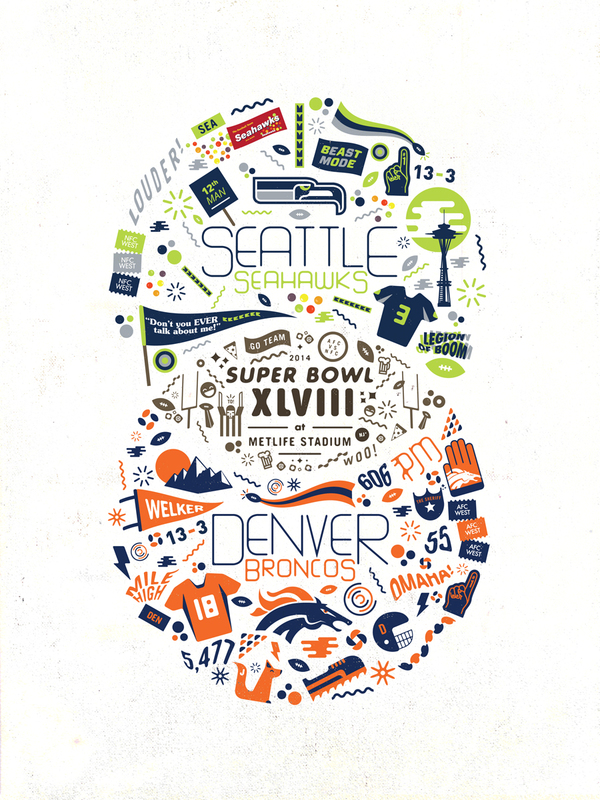 This entry was tagged 2014, broncos, denver, design, football, graphic, peyton manning, seahawks, seattle, Super Bowl, super bowl xlviii. Bookmark the permalink.